We are proud of the St. Andrew Society of Tallahassee and our membership in it. If you aren’t already doing so, express that pride by ordering your SAS Name Tag, Membership Badge, Embroidered Clothing and Tartan Banner today. Name badges may be ordered from Gary Cherry at j.gary.cherry@comcast.net. Name tags with magnetic backs can be purchased for $12.00. Tags with pin backs are $10.00. These attractive metal and enamel badges may be purchased from Betsy Paisley Borges at paisley021852@gmail.com for $5.00 each. 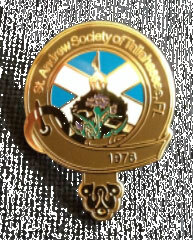 Have the St. Andrew Society badge or your clan badge embroidered on a favorite shirt, sweater, blouse, jacket or hat. Call Laurie Long at 510.9866. Over the years, members have purchased and contributed the tartan banners of the clans with which they have associations. We are proud of our collection and thank all who have generously contributed. As you will see many have donated their banner in the name of a loved one or their Scottish ancestor. We encourage all members to do the same. Tartan banners may be purchased by calling Zellna Shaw at 229.548.2693. Zellna is the founder/owner of The Tartan Lady, which is located in Lakeland, GA. You can also email her at zellna@thetartanlady.com. Because our Society has its own banner size and weight specifications, please be sure to mention you are a member of the Tallahassee St. Andrew Society. You can also call Eric King at 445.1077 for more information.